Traditional Wrecking Bar. Swan necked shape, drop forged steel, polished tips and hex shanks. ..
600mm Demolition Bar Ideal for heavy duty building site work i.e demolition, dismantling timber.. Ideal for heavy duty building site work i.e. demolition, dismantling timber work etc. Forged ca.. 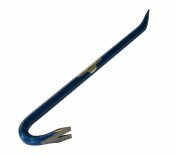 This heavy duty crowbar is 60 inches in length and is manufactured from solid forged high quality.. This heavy duty heel and point crowbar is 60 inches in length and is manufactured from solid forg..